Energy gets a lot of mention but only as it relates to fuel to power our cars and how the price always seems to be going up. Electricity and gas for our homes also get some mention but only when the lights go out. What is not shared, which I will be sharing with you in a lot more detail, is the fact that the retail energy industry (gas and electricity) is a $100 billion industry! We don’t pay attention because it is not as salient (in our faces) as the motor fuel (also called ‘gas’) market. I’ll share some market dynamics, some issues the industry is facing and some predictions for where things are going. Retail energy markets are markets where there are several suppliers, of either gas or electricity, that can serve the end consumer. The utility still transports the energy through pipes or transmission lines to the end use customer, the only difference is that one of several suppliers actually generates/sells you the gas or electricity. 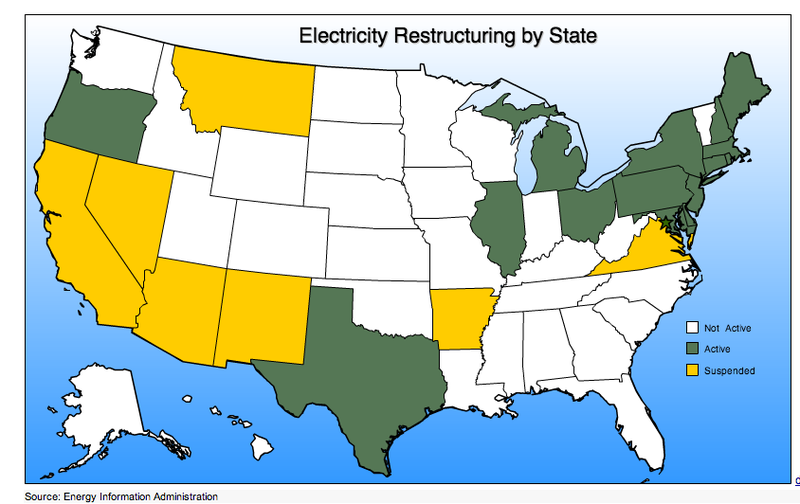 There are 22 states in the USA that have deregulated energy structures (22 of those for gas, but only 18 for electricity). Growth: Retail markets are expected to grow in residential and small business segments as more states get into the mix and current states (especially New Jersey and New York) provide more customer friendly regulations and experiences for ‘switching’ suppliers. There is pressure mounting on Michigan and California to loosen some of the market stifling regulations. Growing market: Twenty percent of the U.S. market is now on retail electricity supply and 2 percent more will be added every year. In layman’s terms 60 million customers currently buy their electricity and gas from suppliers other than their utility. Adoption: Adoption rates amongst consumers are still low but fast growing as seen in markets like Illinois and Pennsylvania. Supplier numbers: There are about 300 retail suppliers in the market with churn of suppliers being matched with new market entrants. This pace is expected to continue as new markets open up. About 56 percent of the residential retail electricity market is owned by five big players (Direct Energy, TXU Energy, Reliant Energy, Just Energy and Dominion Retail). Standards: There is no single standard across the country. This leads to customer confusion across states, complications in the supplier ‘certification’ process across states and the ‘gold rush’ mindset where the rules governing suppliers are not up to snuf. Distributed Generation: Inclusion of distributed generation providers in the mix (e.g. Solarcity who provide solar energy for both residential and small commercial customers) makes for an interesting dynamic that is still in the early stages of playing out. Distributed storage also adds an interesting dynamic. Consolidation: The big five retail suppliers currently own about 56 percent of the market and are gobbling up the smaller/more targeted players in the market (a good thing for those suppliers but might not necessarily be the best for the customers who want ‘choice’). Billing issues: Billing is still done by the utility in the states that are seeing the most growth and this lack of brand recognition (since the utility’s name is still on the documents customers get) is worrying retail suppliers. There is also the issue of billing correctly and billing dispute resolution. Unscrupulous suppliers: As is the case with any industry that is growing there are the less than desirable elements that come in and damage the industry. In the case of retail electricity there are suppliers that offer low “teaser” rates while giving consumers the impression these are fixed rates when in fact they are variable rates, which increase (or very infrequently reduce) after an introductory period. Or suppliers that recruit old ladies in Texas to sell electricity to their children and grandchildren in the electricity industry’s version of a pyramid scheme. Customer Relationship management: As the industry moves from a customer acquisition mindset, the need for customer retention is starting to become important. The suppliers are trying to figure out ways of avoiding paying ~$200 to acquire a customer whom they will only make ~$100 off before he/she goes and finds another supplier. System standardization: Like the telecommunications industry is now doing, there should be a push across all utilities around the country to standardize billing and payment. A customer in Arizona, which is starting to consider deregulation, should be able to look at a Utah bill and understand what is on there (movers make up about 30 percent of new customers on a utility at any one time from data we obtained from Mymove). Customer education: More consumer education is required because if people know better they’ll do better. It’s that simple. Design thinking and user experience: Paying more attention to how the interaction between the consumer and the supplier/utility can be made more satisfactory (even transformational), has so far not been applied to the retail electricity industry. No surprises that I raise this here because my company (www.Power2Switch.com) pays more attention to user experience and design than any other company in this industry. Our tagline ‘helping consumers make responsible energy decisions by using design, data and technology’ is one borne out of our understanding that when customers know better they do better. And this is proving out in the form of thousands of customers using our fully transparent service to find an electricity supplier. Like the healthcare insurance sector (with the players wondering how they will now acquire and retain customers with the healthcare bill changes) utilities and retail electricity suppliers are waking up to a new reality, a reality where the customer is actually king/queen. The utilities/suppliers have to listen as the king/queens just so happen to be $100 billion worth of business.